The International X-Plane Engineering Group (IXEG) has posted another preview image from the Boeing 737-300 project. Olivier Faivre has released the demo version of the soon to be released Consolidated PBY-5A Catalina for X-Plane. Chris Serio has posted another article concerning the ATC system in X-Plane 10 on the X-Plane Developer Blog. Free X-Plane NavData AIRAC 2011.11 is now available to download here. Tom Curtis has posted more preview pictures from the upcoming Golden Gate - San Francisco scenery for X-Plane. Return to Misty Moorings has posted another preview video from the upcoming C.I.R.P. scenery for Orbx Pacific Fjords. SkyDesigners has released French Airbase 115 Orange-Caritat "Capitaine de Seyne" (LFMO) for FSX at SimMarket. - Hand Placed vegetation autogen. - Goodies and eye candies like static people, and others objects for maximum immersive feeling. Sim Skunk Works has posted another test video from the upcoming McDonnell Douglas AV-8B Harrier II for FSX. QualityWings has posted a short preview video from the upcoming BAe146/Avro RJ for FSX and FS2004. Orbx has posted the first preview images from the upcoming Orbx Harvey Airfield (S43) scenery for FSX. Orbx has posted new preview screenshots from the upcoming FTX New Zealand South region for FSX. Orbx has posted several autogen previews from the upcoming FTX New Zealand South region for FSX. Orbx has posted more preview screenshots from Illawarra Regional (Wollongong) Airport (YWOL) for FSX. Precision Manuals Development Group (PMDG) has released service pack 1 to the Boeing 737NGX for FSX. Precision Manuals Development Group (PMDG) has released the -600/-700 expansion to the Boeing 737NGX for FSX. New preview pictures have been posted depicting Seattle International Airport (KSEA) in X-Plane 10. Aerosoft has posted final preview pictures from the upcoming PZL-104 Wilga for FSX. New interior preview screenshots have been posted from the Let L-410 Turbolet project for X-Plane. The freeware Reno-Tahoe Photoscenery for X-Plane is now available to download at X-Plane.org. - Full Authority Digital Engine Control (FADEC). - Realistic flight dynamics based on manufacturer’s specifications. The Aeroplane Heaven Vickers Viscount for FSX is now available to purchase at the Just Flight Website. Eagle Rotorcraft Simulations has been posting several new preview pictures from the Bell 206B JetRanger III for FSX. New Zealand Vector Land Class (VLC) has posted the first beta screenshots from the upcoming Opotiki scenery for FSX. David Molyneaux has released the freeware Auster AOP.11 for FS2004. Download at the BritSim Website. TropicalSim has released Tirana International Airport (LATI) for FSX and FS2004. Purchase at SimMarket. LHSimulations has announced CityGlow, available with the upcoming Pécs-Pogány Intl. Airport (LHPP) scenery for FSX. Orbx has posted the first preview screenshots from Illawarra Regional (Wollongong) Airport (YWOL) for FSX. Aerosoft is offering a Halloween Hardware Special 20% discount on select hardware products. Until Nov. 1st 2011. The freeware Rion-des-Landes Airport (LFIL) for X-Plane is now available to download at XPFR. Dan Klaue has released version 2.1 of the Embraer ERJ 140 for X-Plane as a free update to current customers. The freeware Congonhas-São Paulo Airport (SBSP) for FSX is now available to download at Terra Brasilis. McPhat Studios has posted preview screenshots from the PMDG 737 NGX - AeroMéxico (AMX) HD Textures. IRIS Simulations has posted a beta test video of the Meggitt Avionics EMD from the IRIS Pilatus PC-21 for FSX. Orbx has posted the first preview screenshots from the upcoming FTX New Zealand South region for FSX. 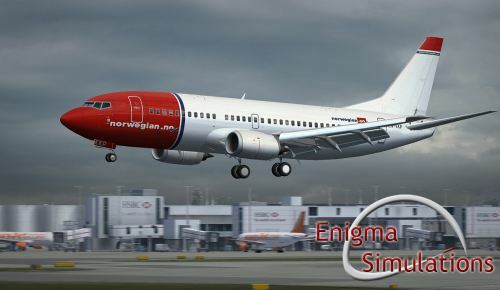 Enigma Simulations has released the freeware Boeing 737-300 for FS2004 Beta. Details in the ES Forums.